The emitter is on the right, associated with the PIR sensor I purchased at Banggood. The receiver is on the left, quite simple circuit. I will later add an ESP8266 module that will send a message to API ThingSpeak, which will then relay via Twitter or mail for instance. Next step will be to link this with a notification center to interact with MyHome app. Check my github for the transmitter and receiver code. Caution, I’m using VirtualWire library. Pins are directly set in the library so use 12 to emit, 11 to receive. You can also use RadioHead or RC Switch. Caution with the PIR sensor, connections may change according to the version or manufacturer. I had to take off the fresnel lens to see the VCC/GND/DATA pin connection. My objective is now to have several modules of this type. Main issue will be for the receiver, having several transmitters. If it receives messages at the same time, the checksum will make it fail to see them. This is why I started to give kind of an ID, checking the first letter of the message I’m sending. However, as this is designed to be an alarm, the thieves would probably enter by the same door, thus one single message sent at once. 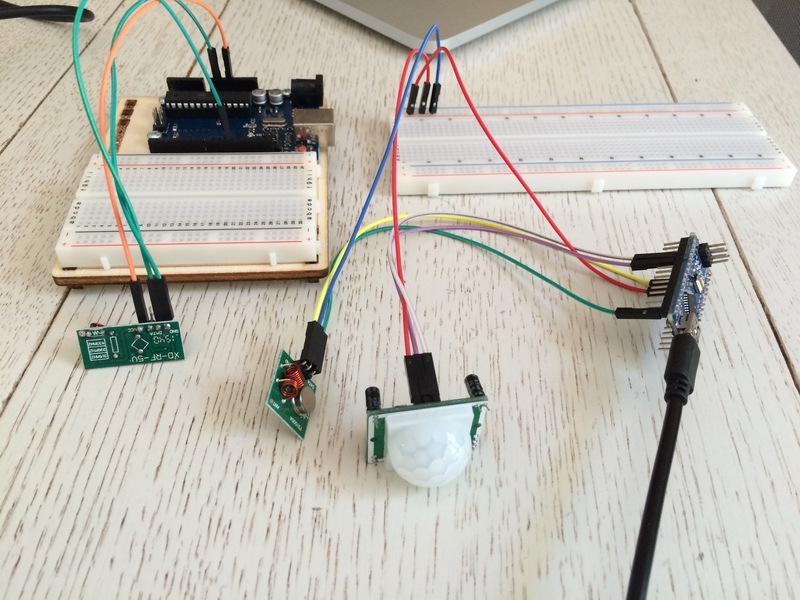 Alarm with PIR sensor and RF module to declare an intrusion ! par MadeInFck est sous Licence Creative Commons Internationale Attribution-Pas d'utilisation Commerciale-Partage à l'identique 4.0 . ← MyHome app : new design!